Well, my quest for winter bonus points commenced with Mts. Ritchie and Donna Buang and continued the following weekend with a planned 5 summit haul Not a forgettable Day! 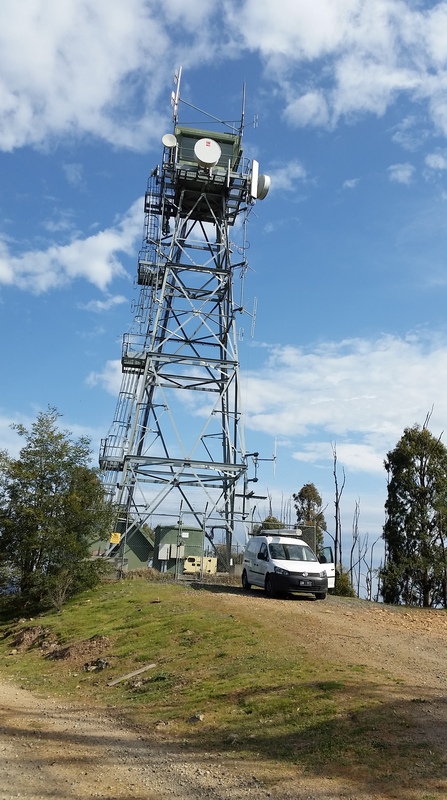 For this weekend, I planned to re-visit my first ever activation Mt. Torbreck followed by Bill Head and Pyramid Hill. This time, due to the alpine road closures, to access Mt. Torbreck, I would have to walk up the Barnwall Plains Rd from Conns Gap Rd – adding a couple of kilometres to the journey. It was to be another 6:00 am departure, I actually left home a little earlier than planned. No need to re-fuel The WX was perfect and with the new poles and boots, I made excellent time to the summit where I set up on the south east side of the cairn in some shade. Propagation of late had been lousy so the previous day, I first knocked up a 2 metre dipole that morphed into a 4 element yagi. I was keen to see how this worked so I set up for 2 metres first. Phone coverage here is excellent so my first spot was for 144.200 and I promptly got a 5×9 report on SSB from Ron VK3AFW. Things were a bit quiet on 144.200 so I moved down to 144.100 and worked 3 further stations in the Melbourne and Geelong areas. I did try pointing to the North East but nothing was worked. I will do a future posting on the 2 metre antenna and operations. Wanting to maximise S2S opportunities and also qualify on CW, I moved to HF. This required removing the yagi from the squid pole and setting up the doublet. I started of on 40m CW with 9 contacts including 2 x S2S then in the few minutes prior to UTC roll over, worked 2 more S2S on SSB. Post rollover 11 further SSB contacts of which 3 were S2S repeats. With 2 more summits in tow, I made a quick retreat back to the car. I remembered from last time that the exit off the main spur to the west, although not difficult to locate, can be confused with a similar looking location prior to the actual exit point. No mistake made this time although the fine weather and visibility certainly helped. On the descent, I caught up with a party of walkers from the VMTC group. I was quizzed about my activities and asked if I happened to know Wayne Merry? Next stop was Bill Head. 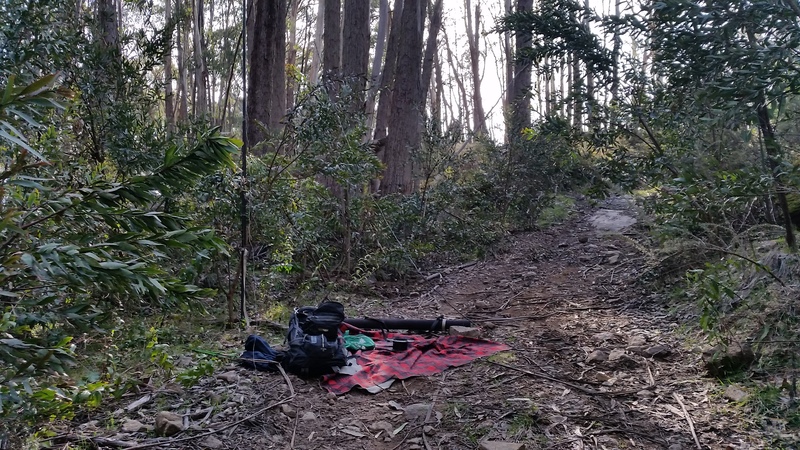 Knowing how scrubby the terrain here is, I unloaded the two metre gear and made sure everything was stowed inside thepack rather than using the side pockets. Did not want a repeat of Mt. Mcdonald! I headed south along Conns Rd to Conns Gap. This is the end of 2WD access and is where the road switches over to the east side of the ridge. There is a large area suitable for parking plus a track that heads up the ridge to the right. I decided to check this track out incase it offered easier access to the sumit. 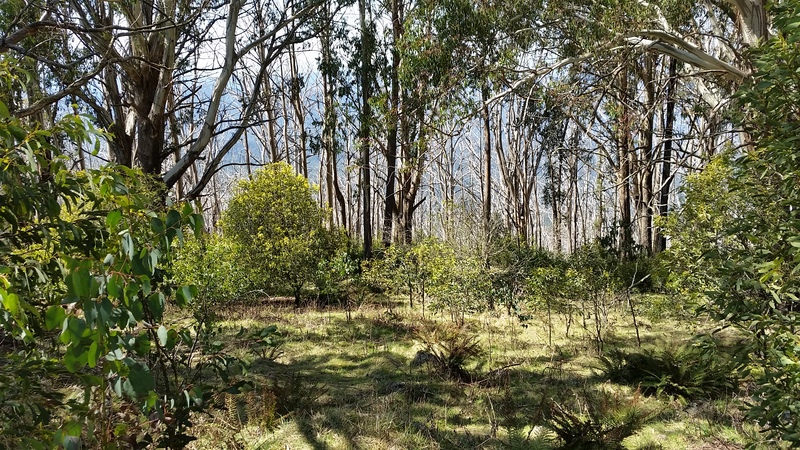 It turned out to be a logging coupe access track and got a bit cut up towards the top, Once there, alarge clearing was found and the track continued south but did not look too promising so I turned back to Conns Rd. and continued on my original plan. This was to park off to the side of the road where the road levels off after a bit of a climb (very slippery in the wet) and is the closest point to the crest which can then be followed south into the activation zone. This route avoids the steepest sections further south. Parking the car where there was just adequate space, I headed up through logging re-growth, fallen and burnt timber to the crest. The going was hard and slow with te WX now quite hot. 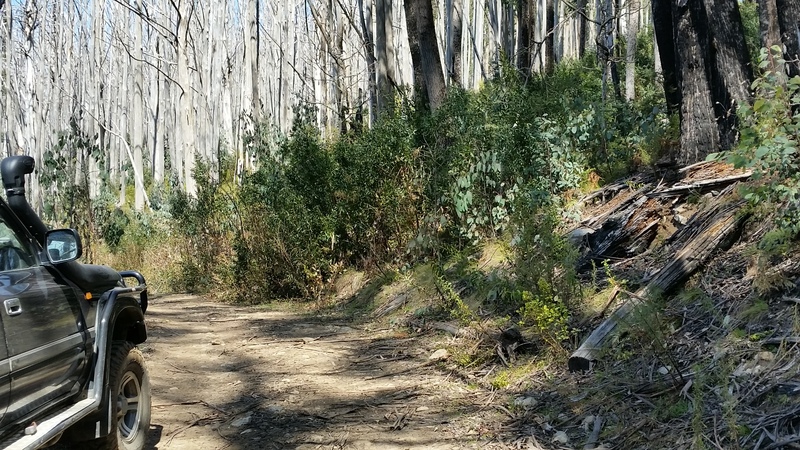 Large fallen Vic Ash trees – victims of the bush fires- provided a welcome bridge above some of the forest debris but the going was still slow. Reaching the main ridge, the going gets a bit easier but some obstacle detours were still required. I made my way safely into the activation zone, not bothering to try and locate the actual summit – still have not been there, next time? I set up on the east side of the crest in some shade. Phone coverage was OK, May have been best on the crest or the west side perhaps? I started off on CW, sending an automated CQ while checking for phone reception and getting things organised, hoping the RBN (Reverse Beacon Network) would pick me up. I then realised I had still not set up the CW paddle and also saw that Andrew VK1NAM was looking for me on 7.090 SSB for an S2S contact. I abandoned CW and went to SSB, working 4 contacts prior to catching up with Andrew. Thanks to Col VK3LED for putting out an alert for me. Then it was a quick spurt on CW with 6 further 40metre contacts. Running low on both water and time, I packed up and, rather than following my ascent route, I headed north for a short bit and then with the aid of gravity, pushed my way through down to the road (hard to see until you are on top of it! ); then a stroll north to where the car was parked. I was in 2 minds as to either continuing south back to Snobs Creek Rd and then north to #5 Rd. or go back the way I had come. I decided on the latter as I knew the raod was all open. Was this an omen? Phone coverage was patchy. Due to time constraints I activated inside the zone but still below and to the south of the actual summit. I worked CW only, relying on the RBN for a spot and that I was only 5 minutes behind schedule. 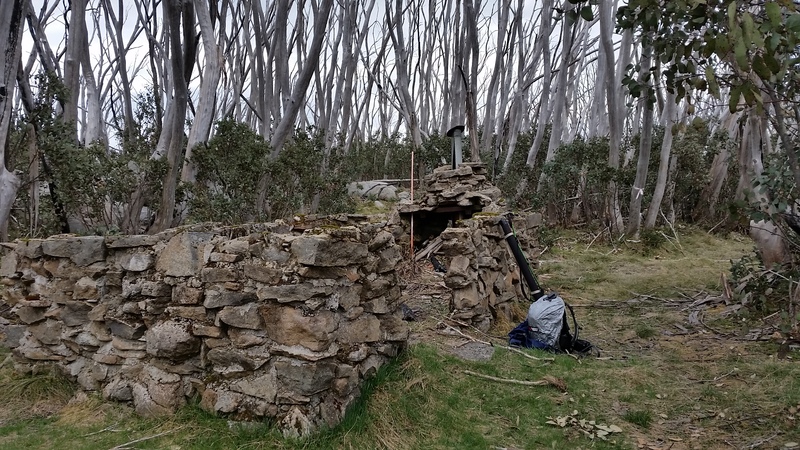 Correspondence with Andrew VK3JBL and Warren VK3BYD on access to this summit had me wondering. The issue was with a sign and logging coupes. I knew that there was a coupe located past the track that heads north along the Royston Range but by the sounds of it, and from past experience on the Royston Range, I knew there was now a lot more going on. 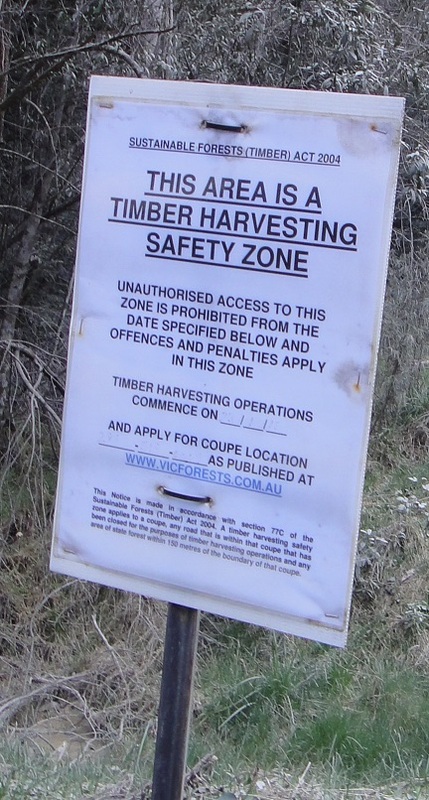 The sign refers to Timber Harvesting Safety Zones. Active THSZs are identified in the forest by signs on roads which may provide access to the THSZ. Unauthorised access to the THSZ is prohibited from the date specified on the sign and penalties may apply to persons within the THSZ, unless they are on a road that has NOT been closed. As there was not a road closed sign, then you could deem it to be open? Only 288-516-0007 is indicated as a THSZ and the date is from 28/04/2015. This coupe is not applicable to Pyramid hill. With the intention of saving some toime on the way home, I decided to continue along the #5 access road to where it joins onto Browns Rd and then the Royston Rd, giving a good run then down into Rubicon. This proved to be a folly. There were some logging activities and coupes along the way then an ominous sign. Road Clsoed and in big red letters, Prepare to Stop. No further progress and I was only just short of the Royston Rd near One Boot Bridge! Bugger! Heading back out I waved down a sedan that was heading towards the road closure. Puzzled as to why they were there, I was greeted by two Indian ladies and a child. “Is this the way to Melbourne?” they asked. For the second time in as many weeks, I escorted someone back to civilisation. I wonder how far they would have gone – the aggressive gravel on the road alongside some of the coupes could have caused havoc with their road tyres. Where had they come from? Will never know! With the winter bonus finishing on the 14th of October, I had one more opportunity to grab some extra points. 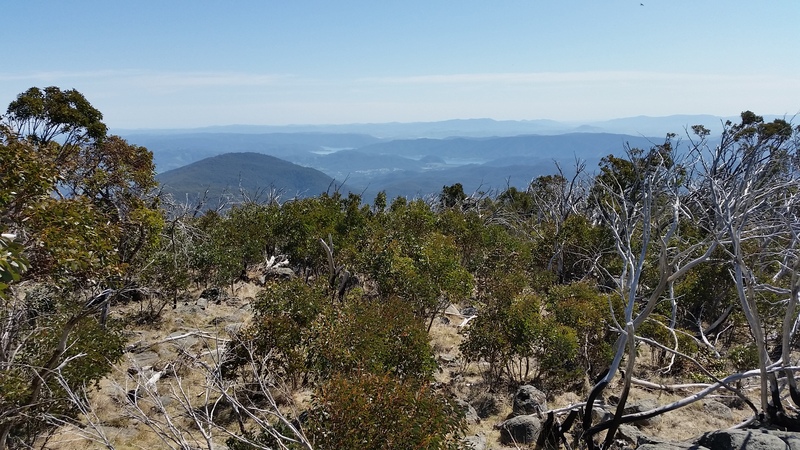 This time I chose Federation Range as the walk is not difficult and only about 4 kilometres each way – easily completed in an hour. I also did not want to be travelling all day or have a another 5:00 AM start. From East Brighton to the Lake Mountain car park was just on a 2 hour drive. No issues with a bicycle event this time! I departed the carpark close to 10:00 am and was at the summit just prior to UTC roll over but still had to get things set up. Activation time 1 hour & 25 minutes. Only 15 contacts in the log. By 00:05 hrs UTC I had the doublet up; I could see that Rod VK2TWR/P and David VK3IL/P had been spotted 20 minutes or so earlier and thought to see if I they were still there. Well, the band was absolutely dead. Nothing! Come to think of it, I had been monitoring 7.090 in the car and had not heard a peek either. I then took the doublet down and put up the 2 metre yagi. (Still some improvement works on the driven element mounting required.) 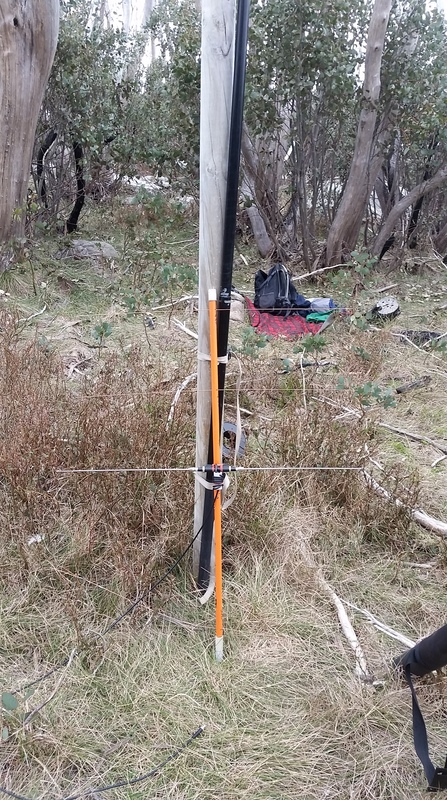 I put a selp spot out on 144.100 SSB and had 7 contacts in 10 minutes into the Melbourne and Gippsland areas. I had qualified the summit on 2 metres inside of 4 minutes! Seeing Warren spot on 7.032, I pulled down the yagi and set up the doublet and promptly worked Warren VK3BYD on 7.032 CW; them moved down to 7.028 to work Vk7CW and VK2IO. Signals to Tasmania were quite good but by contrast, Gerard was only an average copy. Warren on Mt. Table Top near Dinner Plain was also workable on 30 metres. The signal much the same as 40 metres at 529 and I suspect just a ground wave over the 130 km path. With bugger all going on HF, tried 20 and 30 metres too, I went back to 2 metres to work Ron VK3AFW on SSB and CW – allowing me to qualify the summit on CW. 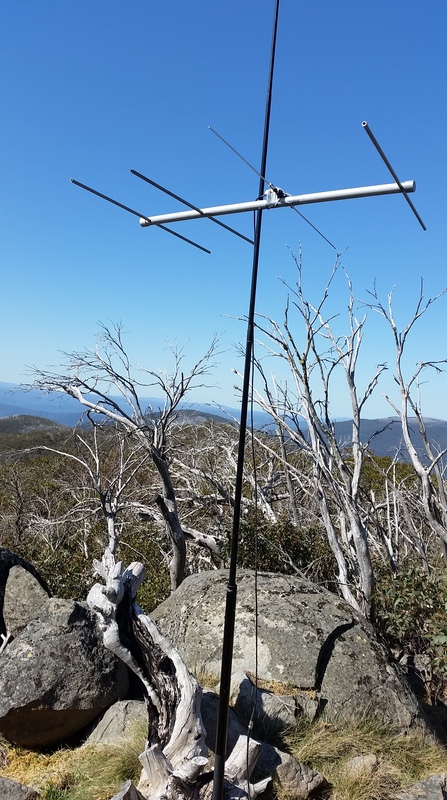 I also worked Glenn VK3YY who was portable but not on a summit. 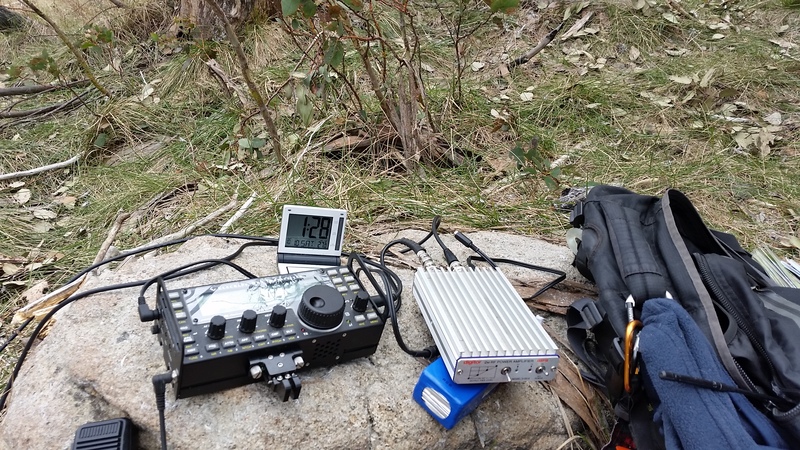 Quick antenna change again when Mitch VK3XDM/7 spotted himself on 7.090 from VK7/WC-003 and got a solid S2S which was not too surprising based on the previous contact with VK7CW! Last roll of the dice was 6 metres with a 5×5 contact on SSB with Steve VK3MEG – with me using the doublet. Over the activation period, the sunshine gave way to storm clouds and thunder. I got hit with a few short sharp showers but nothing too drastic. May need the wiper option fitted to the KX3 display panel. Being mostly down hill, I was a bit quicker on the return trip to the car. I was however running a bit late for my 03:00 schedule on Mt. Gordon so I wound it back another 30 minutes. Activation time 1 hour 10 minutes. The log pretty much says it all. Propagation had gone from bad to worse. A cursory scan of the bands before calling detected nothing. Just a high noise floor on 10 metres. VW Caddy has an outing! I spotted for 40 metres CW on 7.032 and got 2 contacts with the ever present VK2IO and VK3AFW. The signal reports were far from flattering. With nothing further on HF in nearly 20 minutes, I put up the 2 metre yagi and beamed to Melbourne. It was slow going even here, guess people were out in the sunshine (as I now was!). I got 2 contacts with VK3ACA and VK3YCQ plus another with Ron VK3AFW (5×9+). That at least qualified the summit but not on CW this time. I saw Mitch VK3XDM/7 spot on 40m SSB from VK7/WC-005 and I could here him working Peter VK3PF. With the antenna lying on the ground, I hit the tune button and gave a call. No good, antenna works best when in the air so down with the yagi and up with the doublet; this followed with a solid S2S contact. Lastly I tried 10 metres with a good report from David VK3BY located in Cheltenham. I also worked David on 52.200 with a similar received report. I moved down to 50.200 for a 2 way contact with David but for some reason the doublet would tune at best 3.5:1. 04:52z VK3BY 50MHz SSB Dave 5×4, 54 ant not tunning 3.5 :1 hr?? With nothing further happening – Home James! I had contemplated re-visiting Mt. Dom Dom VK3/VN-017 on the way home but decided against it. Based on the days activities; it was hard going with the contacts and would most likely be more of the same. Dom Dom is also quite a tight summit to operate from and the access, based on last year, was hard and slow going through thick forest regrowth. Another time perhaps? Thus ends the 2015 Winter Bonus Period for me! In summary, in just under 1 month (12th September to 10th October), 11 activations, 1 x 10 point, 9 x 8 point and 1 x 4 point summits and 30 bonus points – all up 116 points. The S2S log did pretty well to with 285 points in the bag. Who said SOTA was not competitive?